india suffers considerable losses due to crop damage every year. assocham has pegged this loss at Rs 140,000 crore for 2006-07. Unfortunately, there is no way to ascertain whether this or similar statistics are reliable. But the government might just have come up with a monitoring mechanism. The only method that the government has, at present, to find out statistics of crop losses is through patwaris. There is no system to monitor false claims of crop losses. The Union ministry of science and technology (most) has developed a computer-based model, which uses biomass index to monitor crop health. The model is being tested in Haryana--among the three major wheat growing states in the country. The biomass index is calculated with the help of remote-sensing data on rainfall and soil moisture. "The biomass index graph will rise with the growth and ripening of the crop. If there is an abnormal dip somewhere, it indicates crop damage either due to excess heat, irrigation issues or diseases," says Devender Singh, a scientist at the ministry who is working on the project. According to the plan, state governments will monitor biomass index graphs and assess crop health. They will also keep tabs on patwaris' claims. "Farmers from Jenabad in Rewari district near Gurgaon said their crops were destroyed due to hailstorm. When the compensation claims came, the crops had been cut. If not for the biomass index graph, we would have had no method to verify the real damage. The graph, which showed no difference before and after the hailstorm, saved the government of fraudulent compensation claims," said Devender Singh. So, is the model expected to validate compensation claims only? Raj Kumar, principal secretary of agriculture department in Haryana, is hopeful. "We can get information about crop damage, area under crops and other such vital information. Everything depends on what data the ministry supplies. We are working with them very closely," he said. As a check, Kumar said, that the model will run along with the existing system of patwaris. "We will then be able to verify whether crop statistics given by patwaris is correct or not. There will be other applications of the model as well," he said. There are, however, some scientists who say that the biomass index is not a very reliable indicator. "There is no substitute for survey and surveillance. Besides, we have to study the new model for at least one season to see its efficacy," said B Mishra, project director of the Directorate of Wheat Research (Indian Council for Agricultural Research), Karnal. Mishra says quite a few questions still remain unanswered. "Wheat is the most important crop in Haryana. There are diseases like yellow rust, red rust and stem rust affecting wheat. There is this new disease called the Karnal bunt in which biomass is not affected. How will scientists detect plant disease and/or crop loss then?" he asks. Other scientists, on condition of anonymity, say they are sceptical of the model. 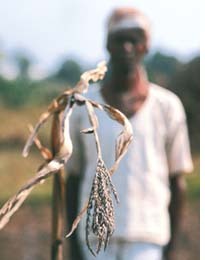 They also say that several models to monitor crop health had been developed earlier but none of them worked. "I have not come across such models in the literature. But the model has to be studied before one can comment on it," said Dewan Singh, head of the department of agrimetrics, Haryana Agricultural University. But the centre is upbeat about the model. "We are sending biomass index data to the agriculture department of Haryana. They were the first state to show interest in the project. Now Punjab, Madhya Pradesh and Gujarat have also evinced interest. We hope to present data for all states in six months," said Sanjeev Nair, joint secretary, most. But the cost of implementing the models in states hasn't been worked out yet. "We started it as an experiment. Since it is working out we will have to figure out the costs," Devender Singh said. Six months, however, seems too ambitious a time-frame, given the obvious infrastructure hitches. Devender Singh, for instance, seemed to be stuck with Internet connectivity the day the correspondent met him in his office. He had been unable to send the requisite data to Haryana agriculture department. "It has been like this for the past six days and service providers haven't been able to fix the problem. It is due to such technological snags that projects in our country get so delayed," Singh said.